After the Last Supper Jesus went to the garden of Gethsemane. Within the garden, which in this miniature is bounded by a wattle fence, he knelt in prayer. His impending death is symbolized by the gold chalice, the Communion wafer, and the small cross that ﬂoats between him and God the Father – all in the top left of the painting. Having ended his prayer, Jesus returned to the apostles, crossing the plank that bridges the stream of Cedron (Kidron). According to the contemporary pilgrim Ogier d’Anglure this was the little bridge that had once been composed of the wood of the Cross, and indeed the artist marked the plank with a cross in his miniature of the Agony of Gethsemane. Christ comes to rouse the slumbering apostles and to warn them of the impending betrayal. A serpent creeping out of a crevice foretells the arrival of Judas with the soldiers, who will soon march down the road from Jerusalem. Deeply sorrowful, Christ bends and lays his hand gently on James. Peter, wrapped in his blue cloak, is propped on one arm, his hand near the pommel of a sword he has brought to defend his master. 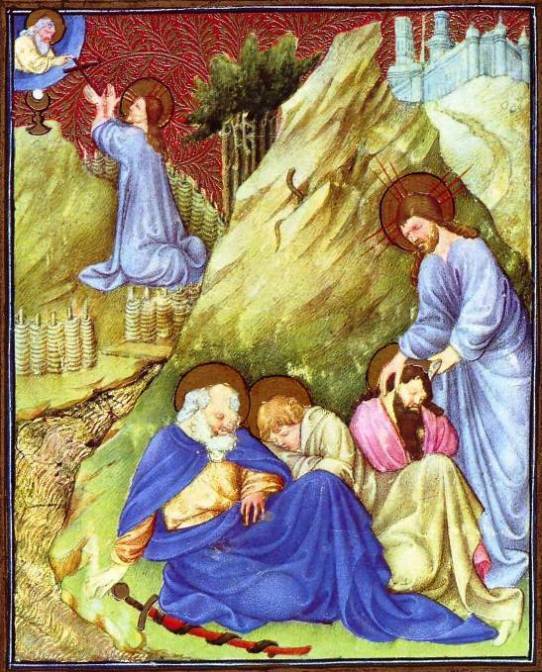 John, a mere youth, has fallen into a deep sleep and leans heavily on the older disciple. The figures of the three apostles are united with Christ by the conical hill behind. Notice its rippling surface as well as the curling folds in the violet mantles and the repeated curves in the composition. The brook of Cedron winds around the hill, its ripples represented by strokes of yellow and transparent green over gold. The entire scene glows with yellow and gold. It is the most sophisticated and most perfect miniature in the manuscript.